Crenincichla sp. “Botox”: male with characteristic fleshy lips. Several species of pike cichlids from the Río Uruguay drainage in Argentina have begun to be exported in recent years. The most attractive of these, including Crenicichla minuano, C. hadrostigma, C. missioneira, and C. tendybaguassu, started to appear in 2006. 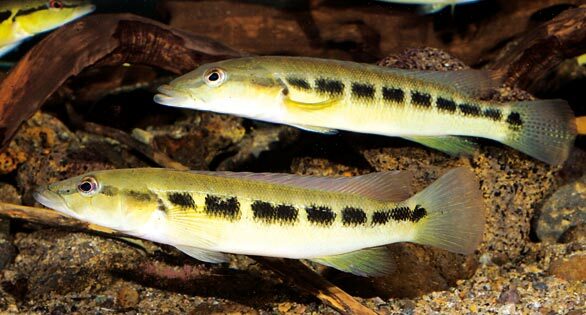 Unfortunately, just five years later these lovely fishes had virtually disappeared into oblivion, despite the successful breeding of what was arguably the most interesting species, Crenicichla tendybaguassu (Big Lip Pike Cichlid), by Matthias Kählig in Hannover, Germany. 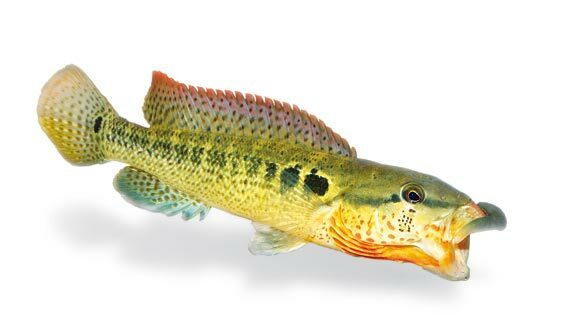 In January 2012, new species were again exported from the Iguassu and the upper Parana drainage, including several very attractive pike cichlids, which hopefully will be preserved in the aquarium hobby. The more than 30 species of the Crenicichla species complex from the Río Uruguay, Río Parana, and Río Iguassu drainage remain something of a puzzle, and it can at times be difficult to identify the individual species. Big Lip Pike Cichlid, Crenincichla tendybaguassu: male with characteristic fleshy lips. 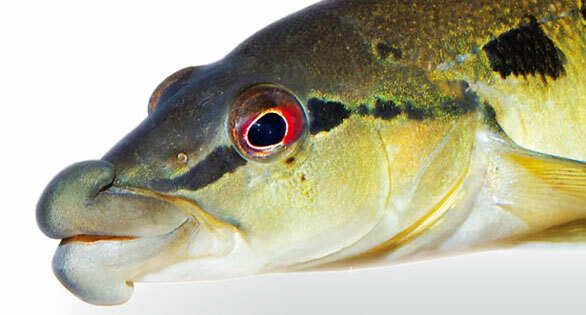 This relatively small pike cichlid with a subterminal mouth is not as striking as the other species presented here, but is suitable for smaller aquariums, where it should be kept with fishes over 1.5 inches (4 cm) long. It is the only one of the species presented here that can be kept and bred in a 50-gallon (190-L) tank. Its behavior and appearance are similar to those of Crenicichla minuano from the Río Uruguay drainage. As in many species of the C. lacustris complex, females are easily recognizable by having one or more ocelli (eyespots) on the dorsal fin. Males have a completely red- or pink-colored dorsal fin and small dots on the flanks. Length: 5.7 in. (14.6 cm). This is an attractive, medium-sized pike cichlid of the C. lacustris group. Females have a very clearly defined ocellus on the dorsal fin. The species is widespread in the middle Río Parana. It is generally more aggressive than C. yaha, but can nevertheless be maintained in a 75-gallon (284-L) aquarium. Larger fishes, such as Gymnogeophagus or Australoheros cichlid species from the same region, make suitable tankmates. Length: 4.5 in. (11.5 cm). The Crenicichla of the Río Iguassu drainage are particularly difficult to identify, because in addition to C. iguassuensis, C. tesay and a new, still undescribed species have occasional specimens with well-developed lips. This means that within a single species there can be a series of forms that appear not to belong together on the basis of head shape, but nevertheless form part of the same species. My C. iguassuensis, which is now 8 inches (20 cm) long, seems to be doing well in a 120-gallon (450-L) tank with a turnover rate of 5,250 gallons (20,000 L) per hour. 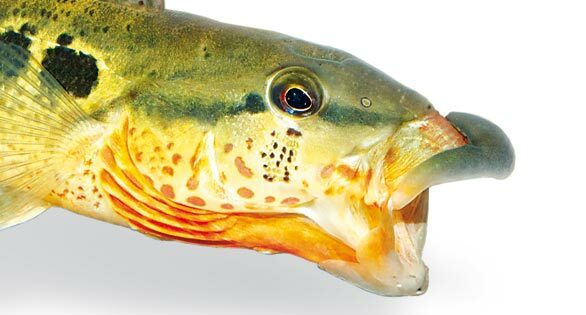 Its boisterous behavior and large mouth suggest that this species might present problems in a smaller tank or one with less water movement. Length: 5.5 in. (14 cm). Crenincichla sp. “Botox” one of the most noteworthy of the newly imported species. Crenicichla sp. “Botox” is being kept in the same tank, and is an ideal occupant despite its smaller size. The powerful body is shorter than that of the somewhat similar C. tendybaguassu from the Río Uruguay, but Crenicichla sp. “Botox” is far more attractively colored and is certainly one of the most interesting of the pike cichlids. Males have a striking red lower lip and gills and a multitude of small dots on the flanks, typical of all species of the C. mandelburgeri complex. Fully colored males of this species are extremely intolerant of rivals, but generally leave males in subdominant coloration, females, and other fishes in peace. Females have an elongate ocellus on the dorsal fin and a light yellow base color, with few or no dots on their flanks. A word on names: since the first pictures of this fish were sent to me in 2009, the collector and I have used the name “Botox”. Pialek et al. (2010) called the species Crenicichla sp. “Iguassu Big Lips 2”, which is also a good name (though “Angelina Jolie” might be more appropriate). Unfortunately, the species has also appeared on the Internet under the pseudo-scientific name Crenicichla sp. “Tendyguassu”, a reference to its similarity to C. tendybaguassu from the C. missioneira complex, but it is not closely related to that fish. It is probably better not to use that name, in order to avoid mix-ups. The first photos of Crenicichla hu made it clear that this was a new species. Up to that time, no black pike cichlids had been known from the southern species complex. The males of this species bear an amazing similarity to Crenicichla cametana, so it isn’t very surprising to find that Crenicichla hu is very aggressive and quite unique among the southern pike cichlids. The species is the only Crenicichla in the Arroyo Piray-Mini, a tributary of the upper Río Parana. The name hu means “black” in the Guarani language of the Misiones region. Males are almost uniformly black or gray with a few dark spots or stripes, and the dorsal fin has a dark red margin. Females are even darker, almost completely black or black-blue, and have a zigzag pattern of black spots on the dorsal fin, which has a white margin. but after that the males were kept separately. Crenincichla missioneira, one of the first pike cichlids to be imported from Misiones, Argentina. A pair eventually formed from a male and two females, and all the other fishes had to be removed from the tank shortly thereafter. After two days of violent combat the pair are now living happily together and exhibit little shyness: just four days after their arrival in Canada the female was taking earthworms from my hand. I hope that peace continues to reign and that the pair will spawn. I would be grateful to have them corrected. Piálek, L., O. Rícan, J. Casciotta, and A. Almirón. 2010. Crenicichla hu, a new species of cichlid fish (Teleostei: Cichlidae) from the Paraná basin in Misiones, Argentina. Zootaxa 2537: 33–46. Read the full article and view all species images. Subscribe to AMAZONAS today for instant access.